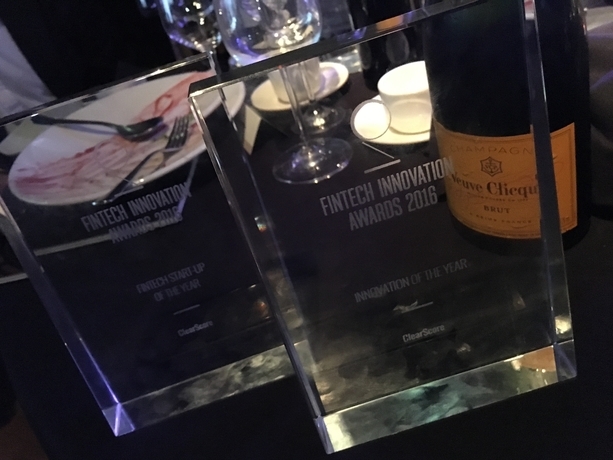 We’re really proud to announce that ClearScore was awarded Startup of the Year and Innovation of the Year at last night’s FinTech Innovation Awards. With over 700 FinTech influencers in attendance, the Awards celebrated teams and individuals who are striving for change within the financial technology sector. Previous winners include investment management service Nutmeg and the CEO of RateSetter. The Fintech Startup of the Year category is awarded to businesses that have ‘disrupted the FinTech space’ by introducing new solutions and challenging the status quo. The whole team is thrilled to receive this award, as ClearScore is all about challenging the mystery surrounding credit reporting and making finances calmer and clearer for people. We were particularly honoured to win Innovation of the Year, a special category for ‘outstanding innovation’ and contribution to technology within the sector. Innovation is at the heart of the ClearScore culture, and we’ve got some exciting plans for the rest of 2016 and beyond which we can’t wait to share. These trophies will take pride of place on our bookshelf next to our Techies and FS Tech awards. We might be able to justify a real awards cabinet soon!